- If you switch ‘invoicing’ on, attendees CAN ask for an invoice when they register. In this case they will be asked to enter their invoicing details (organisation name, adress, VAT number). After the registration process an electronic invoice (PDF) for the total order amount will be generated and sent by email. 1. Enter your invoicing details: you can do this in the screen ‘account settings’. On account level you enter your VAT number and a VAT percentage. The reason we let you enter a VAT percentage is that this differs from country to country. In Belgium for example, it is 21%, but in other countries different VAT tariffs apply. The VAT percentage that you enter will be added to the ticket prices you have defined, to result in the total price (incl VAT). This rule is valid for both attendees that ask for an invoice, and those that don’t. There is one exception on this rule. When an attendee asks for an invoice AND the attendee has a VAT number from another country than the organiser, VAT is not applicable and no VAT will we added to the price. You enter your event details and switch on the possibility for your attendees to ask invoices. Note: all invoices will contain your invoicing details and the VAT percentage you entered. You enter this information on your account settings. Case 1: The attendee asks no invoice. The VAT percentage of 21% will be added to the ticket price you have defined. The registration process continues as usual (booking, online/offline payment, the tickets are sent). No invoice will be sent. Case 2: The attendee asks for an invoice, and enters the mandatory invoicing details. Case 2.A: the VAT number of the participant is from the same country as yours (Number type: ABxxxxxxxx). In this case the VAT percentage will be added to the ticket price. The registration process continues as usual (booking, online/offline payment, the tickets are sent), and the invoice is sent. Case 2.B: the VAT number of the participant is NOT from the same country as yours (Number type: XYxxxxxxxx). In this case the VAT percentage will NOT be added to the ticket price. The registration process continues as usual (booking, online/offline payment, the tickets are sent), and the invoice is sent. Now, we know that the VAT rules as described here will not cover all specific cases that can occur. In order to keep it simple we have chosen (together wit our customers) to work like this because it covers most cases with a simple set of rules. Note this feature is still in beta, some forgive is the little bugs that might still appear! Personal contact: personal contact is key for good long term business relations, next to generating new contacts. Sustainability: environmental awareness is hot these days, also in event industry. What is the general feedback on this edition? How did the registration and acces control process work out? And now? Up to edition number 4? We thank Peter for this interview and the great collaboration! Setting up a PayPal account to start collecting online Payments is quick and easy, and we want to share with you how to do so. Choose the right account type “Premier” or “Business”. Those are the only accounts that will allow you to take credit card payments as well. 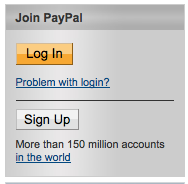 If you already have a PayPal account, you can opt to upgrade as well. PayPal will send you an activation mail. Don’t forget to click this link. Without first activating, you will not be able to take in online Payments via credit card. Log on to www.fikket.com, and start using the same email address as the one you used in PayPal to sign up. Ticket sales revenue will directly arrive on your PayPal account, so that you start collecting money instantly! You are done! As from now, all the ticket sales money will be directly put on your PayPal account. Organizing and event requires a lot of your time and organization. Searching for a location, working out a programme, sending out invitations, collecting participants data, searching for presentors, contacting spronsors, etc. Why do companies put so much effort in seminars, conferences and business events? On top of that, some of them are completely free. So let’s have a closer look at what is the importance of organising business events with your company or organisation and spending time and money in it. By organising events like seminars for your (target) clients, conferences for your equals, or meetings for a certain niche market, you build a relationship. People will start looking at you as a kind of reference in your domain. Openminds, a Belgian Ruby on Rails hosting company, organises every 6 months a conference for Ruby on Rails programmers and interested people. And this is good. As well for the programmers, as for Openminds. They put together people with the same interests and hobby. You can meet other programmers, there are speakers, you can learn more about your profession or passion, and if you want, you can even present yourself for your colleagues. In this way, Openminds is building a real Ruby on Rails community in Belgium. And by building a community, you become a reference in this community. And is there anything better then being a reference in your community / market? If you are a reference in a market, you’ll never be out of business. The one who DOES the most is a reference. Not the one who KNOWS the most. Hence it’s important to DO something, and consider organizing a seminar, conference or workshop for your (potential) clients or market! 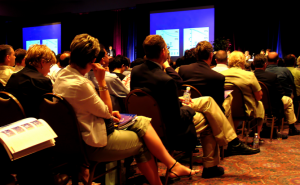 What are your experiences with organizing events for your business or organization? Over the past months we have been receiving lots of hints and concrete request for new features for our online event registration platform. We are happy to see so much interaction, and we kindly ask you to continue this interaction by proposing even more features, or by voting for features proposed by other Fikket users. So what have you been asking for the last months? Repeating the same or a similar event multiple times? You can now clone an event by clicking “Copy”. Your event will be duplicated, including event description, title, map, tickets and prices, data collection fields, discount codes and ticket confirmation mail. This will save you a lot of time when organizing lots of similar events. If you want to accept off-line payments (at door, bank transfer,…) you can now specify clear and bold payment instructions to your attendees. Those payment instructions will be sent together with the ticket confirmation mail. Extra booking fee for online/offline payments. Ever wanted to stimulate your attendees to pay online because in order to collect money upfront? You can now do so by playing with different booking fees for online and/or offline payments. Thanks to the booking fee, an online payment will be cheaper or more expensive than an offline payment. Reasons why it could be interesting for you to stimulate to pay online, is that you don’t have any administration work anymore for payment collection. Reasons why it could be interesting for you to stimulate offline payments is that you will not have to pay the credit card commission. Export and download your attendee list to CSV, in order to play around with it in Excel, Google Docs, or any other spreadsheet: print named badges, sort and filter or send it as an email attachment to your team. You have a proposal for any other features? Let us know – your opinion counts! I hate myself on video…but OK here we go! Last months, we have been pitching at multiple locations, and we have been captured as well on video. Here two of those video’s. I don’t like at all to see myself on video, but OK, so it be. Those videos will in any case let you understand better who Fikket is and what Fikket does. What is nice about this video, is that you can switch between the presenter and the slides. This makes it easy for you to see a close up of the presenter, or a close up of the slides. I advice you to do the last . People like to be treated “special”. To receive something exclusive. You can give your attendees for your next event something special, by offering early bird prices. Early bird tickets are tickets with a lower price. They are typically valid only till a specific date. This creates an urgency or a need to buy them right here, right now. People that are still in doubt wheter to attend or not might decide to buy their ticket if they see that there are early bird prices. Since after this specific date, they will have to pay more for the same ticket! How to do this with Fikket? 2 – When the early bird period is over, delete the ticket type. …or just leave a comment on this blog.